One day my father came home, bubbling with excitement, and told me, “you are going to learn how to read the Quran in Arabic.” It was the most surprising statement I have ever heard him make. My father, the borderline atheist, who only goes to the mosque for funerals, was all of a sudden talking excitedly about the Quran. He had just returned from my cousin Mohammed’s Turbaning ceremony, where, after a stellar recitation, Mohammed’s head was wrapped in a white turban and he was declared Hafez, “a living embodiment of the word of God. One who has completely imbibed the Quran”, in the presence of over a hundred Ulamah. My uncle Abubakar, Mohammed’s father, was so proud of his son that he cried during his Turbaning and for many hours after the event, he chauffeured Mohammed around Lagos, telling anyone who cared to listen about his son’s achievement and everyone, even those who did not know what Hafez meant, commended him on having such an intelligent child. So, my father came back home, green with envy and determined that I would also bring tears to his eyes, make him proud, by learning to read the Quran in Arabic. “If Mohammed can do it, so can you. He was only seven when he started and now look at him. You should have seen the way people were clapping for him,” my father said, as if receiving applause was the most important thing in life. “Don’t worry I have already made arrangements.” He concluded, trying to convince himself and me that this was a well thought out plan and not just some hare-brained scheme that jumped into his head when he saw Mohammed’s turban. So, on the 7th of May 1991, 1411 years after the Hijrah, I walked into Mallam Nasiru’s madras for the first time, right behind my father, who reverently bowed to the frail, almost completely blind old man, who, following the footsteps of his fathers, had dedicated his life to teaching young boys how to read the Quran in Arabic. But when Umaru tried to resist enrolment, his father screamed, “Arabic is the future!! !” before dragging him to the madras by the ear. “You see even Umaru is here,” my father said, grinning in a way that also forced me to smile. We were both relieved to see each other. “Maybe this madras thing wouldn’t be so bad,” we told ourselves as our fathers discussed our futures. We were all impressed by Mallam Nasiru, who despite his advanced age, stood at the door with a jagged grin and welcomed everyone personally. He shook every parent’s hand and patted every child on the head. He bowed to everyone and everyone bowed to him and everyone said, “what a humble man,” in loud whispers which Mallam Nasiru pretended not to hear. Then he withdrew to his office where further pleasantries and monies were exchanged and we became students. Mallam Nasiru’s madras was a large hot room strewn with threadbare prayer mats, whose once bright and beautiful patterns had all but disappeared, slowly fading away under the sweat and strain of the hundreds of students who had knelt and prayed on them over the decades. Mallam Nasiru sat at the head of the class, on a platform decorated with a new, beautifully patterned, desert-brown rug. He always had his Subhah, Muslim prayer beads, in his right hand and a long, thin cane in his left. Behind him, there was a black flag with the word IQRAA, which means Read or Recite in Arabic, stylistically written in white spaghetti lettering. And although a large handwritten Quran with a gold and green cover was always open in front of him, he never looked at it because legend had it that Mallam Nasiru had not only completely imbibed the Quran at the tender age of five but that he had reproduced a handwritten copy from memory every year since. Others said he was nine not five when he became a living embodiment of Allah’s words but many, like my father, discounted both biographies and asserted that he was born with the Quran in his head. Mallam Nasiru’s legend thrived on speculation. There were even rumours swirling around the cause of his blindness. 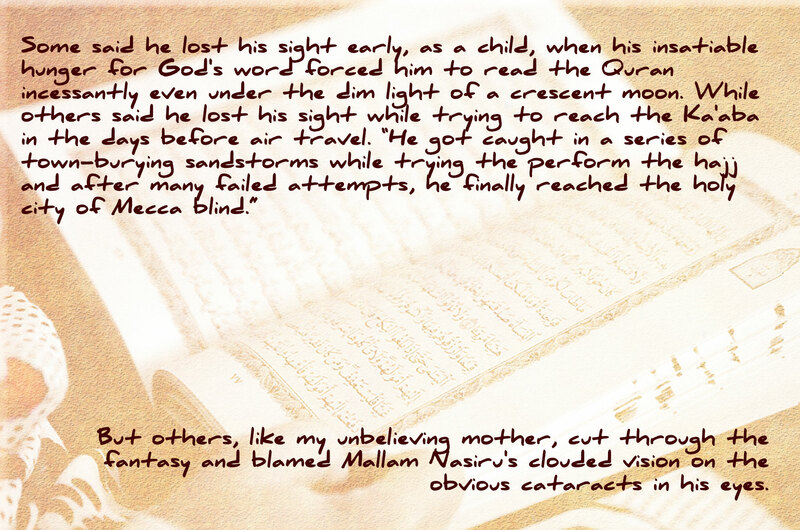 Some said he lost his sight early, as a child, when his insatiable hunger for God’s word forced him to read the Quran incessantly even under the dim light of a crescent moon. While others said he lost his sight while trying to reach the Ka’aba in the days before air travel. But others, like my unbelieving mother, cut through the fantasy and blamed Mallam Nasiru’s clouded vision on the obvious cataracts in his eyes. Our parents left and lessons began. And I’m sure he said many other important things on that day but I could no longer concentrate on his lesson because Mallam Nasiru’s madras was very uncomfortable. This was mainly because the large room wasn’t built for human habitation, it was sometimes used as a cement warehouse which explained its dustiness and the lack of windows that made it an oven in the summer, and as if that wasn’t bad enough, the threadbare prayer mats harboured blood lice. Even now, as I write this story, I can still feel them crawling on my skin. Hot, itchy, uncomfortable and unable to concentrate on the dog-eared pages filled with words that ran right to left and curled in and out of themselves like spaghetti, Umaru and I exchanged restless glances. And we would have stayed despite the discomfort, but when we heard the sound of the neighbourhood children playing football on a nearby field, Umaru and I, unable to resist the temptation, snuck out of the class and went to worship Maradona. The field was spring green in the summer sun and the neighbourhood children welcomed Umaru and I like long lost friends. The year was 1991 and although Argentina had lost the World Cup final the year before, Diego Amando Maradona was still the best player in the world and Umaru and I loved the diminutive Argentinian. Umaru’s father had a ninety-minute summary of Mexico 86, a World Cup Argentina won, and although we had watched that tape a million times, we still cheered like madmen every time Diego lifted the trophy or scored his Hand of God goal against England. We were always wearing the sky blue and white jerseys of the Albiceleste. Umaru wore Diego’s number ten while I had on the number eight of Claudio Caniggia, our third most beloved player, right after Roger Milla. We took to the field and tried our best to imitate the extremely selfish play of our heroes. We never passed the ball. We always wanted to dribble all the defenders and walk the ball into the net like Diego but the neighbourhood children, who were much bigger than we were, were having none of it. They brought us down with hard tackles that left our jerseys dirty and our shins sore and although we incurred many free kicks, our selfishness ensured we didn’t score a single goal. Our team lost that match 3-0, three nil but we were happy losers, anything was better than being cooped up in the madras. We had such a good time that we snuck out of Mallam Nasiru’s madras every day for the next week and when the blue rubber ball we were playing with got punctured on a barbed wire fence, it was Umaru and I who paid for its leather replacement. In time, we became less selfish, but our teams still almost always lost by more than one goal. We didn’t mind the defeats, in fact the hours we spent on that field, dreaming of playing for Argentina, were the best moments of our lives. Mallam Nasiru was almost completely blind, so, he never noticed Umaru and I sneaking out of his class, but he was not deaf so while we were worshipping Maradona on the nearby field, he could hear the neighbourhood children hollering our names, yelling things like, “Suleiman pass the ball!” “Umaru shoot!! !” Curious, he asked the other boys in the class where we were, and jealous of our freedom, they immediately snitched. “They are outside playing football” they chorused. Mallam Nasiru was almost completely blind but his strokes never missed their target. He thrashed the evil Maradona spirits out of Umaru and I, before seizing our Argentina shirts and forcing us to sit down in front of the class so he could hear our voices as we Iqraa’d the Quran. Of all the punishments, the seizure of our sky blue and white shirts hurt the most. Umaru and I became star students in Mallam Nasiru’s madras. We learnt to concentrate despite the heat and in no time became familiar with the spaghetti-like words and their difficult pronunciations. And Mallam Nasiru, impressed by our progress, withheld his cane; instead he encouraged us with praise and gently corrected our mistakes. Learning Arabic was sweet. So, for four months in 1991, Umaru and I learnt to Iqraa the Quran under Mallam Nasiru’s pus-filled eyes but our lessons ended abruptly on the 21st of September, when Mallam Nasiru died 1412 years after the Hijrah and his Naira-concious sons, instead of continuing their family’s proud Ulamah tradition, closed down the madras and converted it into a warehouse for imported goods. Mallam Nasiru ‘s funeral was a simple affair. It was held the next day. He was buried in an unmarked grave, in a cemetery near Festac’s central mosque. Umaru and I attended with our parents and we were surprised by the sheer number of people who reverently formed concentric rings around his open grave. Over the decades, Mallam Nasiru had taught over a thousand boys how to Iqraa the Quran and it seemed they were all present with their family members at his funeral. Suleiman Agbonkhianmen Buhari is a daytime prosaist and nighttime poet who resides in Lagos, Nigeria, where he is working on his first novel and editing an anthology of poems. He also attended the Farafina writers workshop in 2013 and the Port Harcourt Book festival Writers Group later that year. In 2014, he was shortlisted for the Babaisha Niwe Poetry award and his work has also been published in AfricanBookClub.com and other websites and newspapers.